What is a website feedback tool? With a website feedback tool you can dig deeper into the minds of your website visitors. A website feedback tool helps collect qualitative insights about the visitor, such as the visitor’s review of the website and where he/she is experiencing problems. 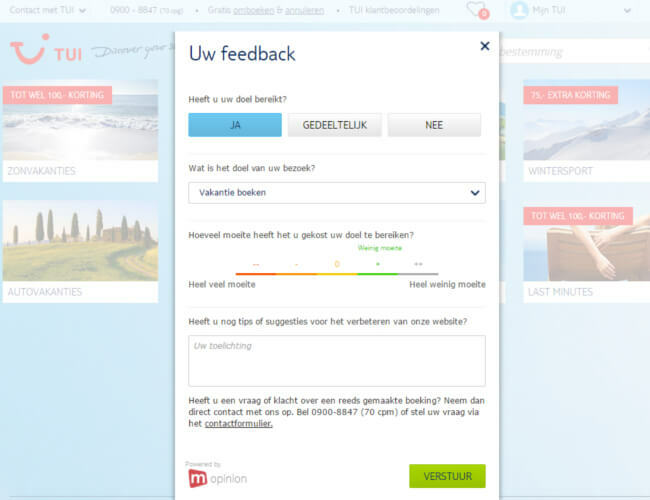 A website feedback tool also makes it possible to interact with your visitors. You can use a feedback tool in many different ways. The most common is in the form of a feedback button often located to the side of the website, where visitors can easily provide their feedback. Usually this is in the form of a score or comment, in combination with a feedback category such as a bug, suggestion or complaint. To remain competitive, it is important to exceed the expectations of your visitors. Did you know that, according to Baymard Institute, around 68% of your visitors leave your online purchasing funnels without buying? Customer feedback software helps measure and improve online customer satisfaction. And with the right level of effort, you will reduce customer churn as well. Why use a website feedback tool? There are several ways to gather information about the website, including usability testing and web statistics. These are valuable ways of collecting information, but mainly provide insight into online behavior (such as clicks) and not the experience of visitors themselves. Using a website feedback tool, you can collect customer feedback by page and get insights into why a visitor does what they do. You can choose to create a feedback form yourself, depending on your exact needs and available time and resources. The benefit of existing website feedback tools is that they are easy to set up and offer dashboards that allow you to analyse feedback in a simple manner. How do you set up a feedback tool? Think about how you want to use the website feedback tool before you get started. Would you like to improve the ordering process or figure out why your visitors are leaving the support pages? Try to minimise the amount of questions in your online feedback form in order to gain as many useful insights as possible. Visitors don’t usually want to fill out lengthy questionnaires. Two or three questions is usually a sufficient amount. For example, you can choose a closed question and follow it up with an open comment section. The more concrete the question is, the more useful the feedback. The advantage of the open question is that you get a better idea of the visitor’s feelings or sentiment about the problem, giving you more focus to solve the problem. After you’ve determined the purpose of the feedback tool, it is important to decide how you want to use the tool exactly. Set the feedback tool up in a place where you are looking for more insight into visitor behavior. Website feedback tools make collecting customer feedback much easier. Once you know what your visitors think is important, you can optimise your website based on that feedback.